Age, sun, diet and environmental factors all conspire to accelerate the deterioration of your skin. Fortunately, you can take a deep breath, let yourself go and experience how highly effective active ingredients and precisely tailored treatment techniques can give your skin a new lease on life. Nothing will resolve your concerns more than talking to someone who really knows their stuff. Our estheticians know the right questions to ask and welcome your questions. Our skin care professionals will be able to explain how and why your skin is the way it is and what treatments will be most effective. They will create a custom plan for your skin. Let us pamper and soothe you with this nourishing facial treatment. Our expert aesthetician will utilize techniques designed to heal and rejuvenate the skin with cleansing, hydration, masques, and a relaxing massage to the face, neck and shoulders. This is a simple and safe procedure for exfoliating the epidermis and ridding the skin of fine hair by gently shaving the epidermis. This is a great treatment for women who are pregnant or nursing who want a deep exfoliation but cannot use peeling agents on their skin because of the risk that the chemicals will be absorbed into the blood stream. This gentle treatment uses a solution that is formulated primarily for ethnic skin, and other extremely sensitive skin types. will strengthen and brighten the skin while helping to treat sun damage and other forms of skin discoloration. This peel also provides anti-inflammatory, anti-blemish and antibacterial action, making it an excellent choice for helping calm rosacea. This advanced hydrating treatment will encourage additional flaking and peeling to produce a tightening and brightening effect. It is a cream mask containing natural phytohormones which plump, hydrate and moisturize aging skin. The retinol content helps increase cell turnover to keep skin looking fresh, while vitamin C strengthens the skin by helping to increase the skins collagen and elastin network. This peel works well on all skin types and conditions. This peel bathes the skin in oxygen, while rapidly exfoliating and hydrating the skin. Use this peel will help revive congested and blocked pores, reduce fine lines, minimize the appearance of large pores and improve overall skin texture. This antioxidant therapy corrects and prevents free radical damage as oxidative and environmental stress of kin is one of the more significant contributors to aging skin. This treatment helps stimulate oxygenation and circulation within the epidermis, rejuvenation sluggish, stressed skin as it draws oxygen to the skins surface, resulting in a radiant, healthy look. Clarifying mask’s blend of salicylic acid with cherry extract and other natural ingredients make this an ideal choice for helping to improve breakout prone skin and sluggish, dull complexions. Its exfoliating, antibacterial and anti-inflammatory benefits refine skin texture and bring new brightness to the skin. This is an excellent choice for detoxifying all skin types. The active blend of lactic, glycolic and salicylic acids effectively penetrates pores to dissolve impactions and blackheads, kill bacteria, reduce inflammation and remove excess cell debris to leave skin purified and clear. An excellent treatment for smoothing, firming and brightening of all skin types, even extra-sensitive skin, including rosacea and acne. Its advanced formula of lactic acid and retinol, along with a hot of polyphenols, antioxidants, vitamins, humectants, and brightening ingredients, improves the texture of the skin, and helps correct many types of skin discoloration. This enhanced Tessmer’s formula is ideal for more sensitive skin types, ethnic skin or those allergic to hydroquinone. This treatment will help unclog pores, clear acne and rejuvenate the skin. The most potent of the Tessmer’s formulas, this peel will even skin tone and provide more exfoliation for oilier, thicker and more resilient skin types. It is extremely effective on sun-damages and thickened skin. This enhanced Tessmer’s formula is for those who want an even skin tone. It will help to quickly lighten pigment discolorations of any kind, such as melasma and actinic damage. This treatment is a non-chemical procedure that uses a spray of micro-crystals to remove the outer most layer of dry, dead skin cells. It’s also used to treat light scarring, discoloration, and skin damage. This treatment uses high level sound wave technology to penetrate deep below the skin’s surface. This treatment promotes cellular renewal and repair, tones muscles, increases blood circulation, encourages lymphatic drainage, helps to combat puffiness and swelling, and improves overall skin care product penetration. 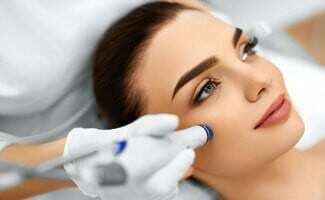 Also called, Microneedling, is a painless procedure that uses hundreds of tiny microscopic needles on a small roller to produce micro channels for introduction of serums to the deeper layers of the skin as well as stimulating collagen production for skin rejuvenation. A multifunction anti-aging treatment that targets wrinkles and loss of resilience by rapidly revolumizing your skin, supporting its natural restoration of more youthful collagen levels. The fast-acting formula features a collagen support complex that boosts your skin’s resilience and plumps dehydrated skin to reduce the appearance of wrinkles, winged kelp smooths skin by fostering natural collagen and elastin, and cellular peptides plump your skin and help smooth fine lines and wrinkles. This facial incorporates a combination of thorough steaming, deep cleansing, facial extractions to remove pore-clogging sebum, and a variation of a healing mask and moisturizer. Salicylic and glycolic acids aimed at managing and thwarting acne flare-ups are often utilized. Generally, a series of acne/deep cleansing facials as well as an at-home care that features a daily skin-care regimen is recommended for ideal results. Hopefully, these treatments will also assist in preventing future breakouts.